Warclaw Mercenary is a common Willpower creature card. It is part of the Houses of Morrowind expansion. "The Warclaws earn their pay." "The Redoran demand your death." 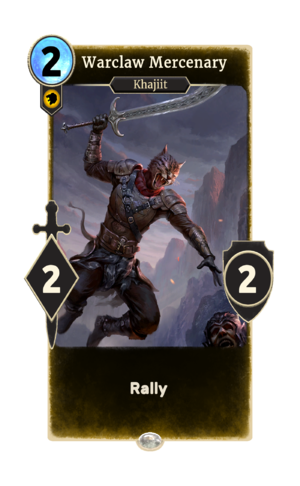 This card is a reference to Ferhara's Warclaws, a band of Khajiit mercenaries hired by House Redoran that appeared in ESO. This page was last modified on 28 February 2019, at 00:00.